· Just like the first picture here, you are not able to login at all and stuck at Welcome Screen. · It happen even after you login your own profile but in actual fact, Windows create a new profile with the similar name but your files gone missing. The above error is what I myself experienced and unfortunately, happened to some of my fellow colleagues and friends… be it Windows Vista or Windows 7, such issues happened after Windows Update or due to third party software that triggers. I do come to know Sony laptops with their sole propriety software could be one of the cause though not proven. Disabling them may prevent it from happening again. But there again, primarily it is a Window issue. This is the reason why I post this solution here after my previous blog was totally wiped out and did a little bit of research. 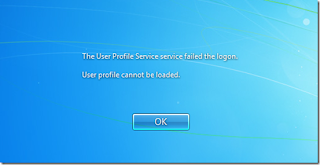 I also have not come across this issue affecting Windows 8 although their registry structure is rather pretty similar but login is slightly different where you login via your Microsoft Accounts. To begin, you need to login to Windows Desktop in order to carry out the solution, else you can boot into Safe Mode and use the Built-In Administrator account. - To boot to safe mode, Press F8 when powering up your system. As a precaution, it is highly recommended that you create a system restore point in case you make a mistake while in the registry. This way you will easily be able to do a system restore to undo your mistake. 2. Click My Computer, select File -> Export to do a backup of the registry. 4. Under the ProfileList, you should be able to see SID (eg. S-1-5-21-117609710-1767777339-725345543-1003) while the other one is with .bak. 5. If the one without .bak shows under ProfileImagePath as C:\Users\Temp, delete the SID (eg. S-1-5-21-117609710-1767777339-725345543-1003).